HomenewsBlogDon’t Get Spoofed And Fall For Phishing! Last year around this time, we introduced our readers to the cyber-criminal act of phishing. Over the past 12 months, spoofing and phishing attacks have become the most common attack vector used by cybercriminals. Many people seem to be confused by the two terms. So, for this month we will clear the confusion, explain how the two actually work together, and provide some ways that you can avoid becoming a victim of these malicious and potentially life altering acts. 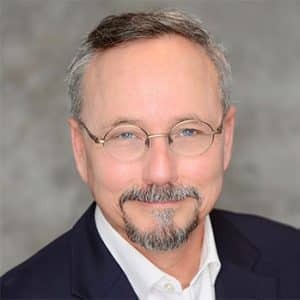 Spoofing is a technique deployed by cyber criminals to modify a domain name, phone number, email address, or IP address, and use it for unlawful purposes. Email is by far the most widely used form of spoofing. The objective of spoofing emails is to trick a user into thinking the email they are receiving is from a legitimate source and coerce them into taking some form of action. When a victim is tricked into believing the email they are receiving is legitimate (successfully spoofed), they will be directed to click on a link or open an attachment. Once they click the link or carry out the request, they can become infected with malware, ransomware, or have their credentials hijacked. This is the act of phishing. I recently received this email from Wells Fargo. 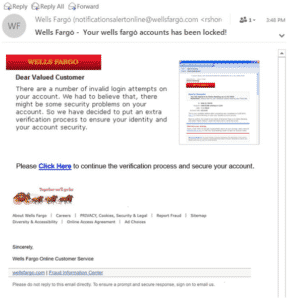 The email address displayed is Wells Fargo (notificationsalertonline@wellsfargo.com). If you look closely at the word Wells Fargo in the email, there is a small dot positioned over the “o”. At a glance, the untrained eye may see this as a legitimate email. This is an obvious attempt to spoof me into clicking the “Click Here” link. Clicking that link would most likely take me to a site that would ask for my username and password or I could be infected at that moment with malware or ransomware. This is a classic form of a successful phishing attack. Another best practice when viewing emails is to hover your mouse over the URL. This will reveal the actual URL where the email was generated. Due to the lack of knowledge and training among the general population, cyber criminals are having tremendous success with these types of spoofing and phishing attacks. The damage they cause to people and organizations can be catastrophic! The most effective way to reduce the threat of becoming a victim of spoofing and phishing attacks is by implementing a phishing simulation tool and security awareness training. A phishing simulation tool sends test phishing emails to see how vulnerable you are to spoofing and phishing attacks. They are designed to keep us alert and simulates different environments at which an attack could happen. Over time, organizations have seen up to a 90% decrease in successful spoofing and phishing attacks. There are several companies in the market that offer these types of services. They are very cost effective and offered as a subscription-based service. There are also open source phishing tools that can be administered for free. Gartner Peer Insights is a great source for reviewing Phishing Simulation and Training programs. We listed the URL in the Sources below. The cybercriminal landscape is only increasing as we get further into the Digital Age. The key is to look for a program that can assess, educate, measure, and reinforce good cyber hygiene. Until next month, wishing you safe travels in cyberspace! GoldSky Security offers small and medium sizes business cybersecurity solutions across the US and currently has offices in Orlando, Florida and in Denver, Colorado.